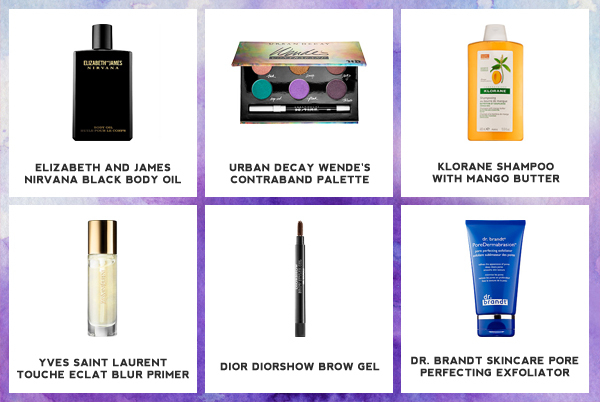 What's New: Urban Decay, Dr. Brandt and More! | Top Beauty Blog in the Philippines covering Makeup Reviews, Swatches, Skincare and More! What's New: Urban Decay, Dr. Brandt and More! From an illuminating primer that blurs imperfections and boosts the radiance of foundation to an easy-to-use brow gel that grooms arches and brings a defining touch to the eyes — here are some of the latest and greatest beauty products that have just arrived in the market. ELIZABETH AND JAMES NIRVANA BLACK BODY OIL - This nourishing, indulgent body oil is enriched with argan, soybean, and moringa oils to replenish skin so it feels silky-smooth and looks beautifully radiant. Simply massage onto damp or dry skin to leave skin traced with this classic scent. URBAN DECAY WENDE'S CONTRABAND PALETTE - Urban Decay's Chief Creative Officer and founding partner, Wende Zomnir, is always jet-setting around the globe. Inspired by her frequent trips, Urban Decay created this travel-friendly palette featuring all her favorite shades. Wende handpicked her top six go-to shades for a versatile selection that ranges from neutral to bright for maximum versatility — from Urban Decay’s iconic purple look to the classic smoky eye. There are even a few exclusive shades. KLORANE SHAMPOO WITH MANGO BUTTER - As a result of a superficial deterioration, dry hair can experience excessive water loss at its core and the keratin fibers can become damaged. Hair becomes dull, coarse, and difficult to style. This shampoo provides lasting nourishment and hydrating care while cleansing gently. Hair becomes softer and suppler for easier styling and less breakage. YVES SAINT LAURENT TOUCHE ECLAT BLUR PRIMER - Touche Elcat Blur Primer preps skin for foundation application, creating an improved, refined appearance: pores seem to be minimized, skin texture feels smoother, and skintone is more even. It’s enriched with four nourishing oils — corn oil, apricot kernel oil, passiflora oil, and rice bran oil — to leave skin feeling incredibly soft without a greasy residue. DIOR DIORSHOW BROW GEL - Shape, define, and give brows ultimate shine in just one stroke. The click-brush applicator is designed to release just the right amount of the thin, gel-serum formula, ensuring you get your desired brow shape with a lasting and lightweight, non-sticky finish. DR. BRANDT SKINCARE PORE PERFECTING EXFOLIATOR - Minimize pores while smoothing and evening skin’s texture with this dual-action formula. This exfoliator instantly works to deeply cleanse pores while it strengthens and tightens the look of pores by removing congestion- and clogging-causing impurities. Your skin will look and feel smoother, more even, and shine-free. The Urban Decay palette looks so pretty! These colors look great for Summer. The Elizabeth and James Nirvana Black Body Oil sounds fantastic - I'll take a look! The black body oil sounds interesting. Very cool beauty picks Miss! ;) Thanks for sharing! Would love to try the shampoo! Wow! I need to try Urban Decay palette! Thanks for shared. The body oil seems great! I would love to try it! I would like to try the black body oil!!! Love this YSL primer!!! is amazing! The primer sounds amazing! I love the foundation so I'll have to try the primer! Oooh, I can't wait for the Urban Decay Contraband palette! It looks amazing! I can't wait! I like the Urban Decay's palette. I love the brow gel. Cool products. great post!! !Thanks for stopping by my blog, !! !happy weekend!!! I can't wait to try the Elizabeth and James body oil. I managed to get someone to pick it up in America for me.